The Karnataka Association of Resident Doctors (KARD) has recently expressed its monetary dissatisfaction- on behalf of the 2500 resident doctors in the state- working in different government hospitals. The issue was the low stipend paid to these doctors, and a follow up request to the chief minister of Karnataka to increase the stipend. However, with no action as a result of the appeal made earlier this month; the 2500 resident doctors from the different government hospitals have now reported an indefinite strike, starting from today, to make the government accede to their demands. 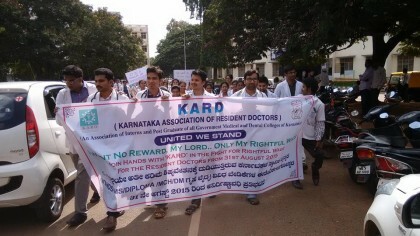 As reported by the Medical Dialogues team on August 24; on behalf of the 2500 resident doctors working in various government hospital in Karnataka, the Karnataka Association of Resident Doctors ( KARD) wrote to the Chief Minister of Karnataka pleading to draw the attention towards problems faced by the house surgeons, the post graduate students (MD/MS/Diploma) and super speciality residents (DM/Mch) studying/ working in govt medical colleges in Karnataka. The letter draws attention to the misery faced by the resident doctors in the state-run hospitals including long working hours, no prescribed number of casual leaves or medical leaves in our curriculum, security, more specifically the meagre pay scale that as the letter quotes makes the residents in Karnataka the least paid residents in the country. “Presently, the Govt. of Karnataka is paying a consolidated stipend of Rs. 15000 ,Rs. 25000 and Rs. 30000 per month for House surgeons, Post graduate students and super-speciality residents respectively” quoted KARD in its letter. It's not govt. funded institute..how foolish can you be??? 25000 eh…we get 8000 for PG residents in KLE hospital Belagavi.